On September 28, 2016, Richie was sitting on the driver’s side of his parked car near 116th Road and 205th Street when he was sideswiped by a U-Haul truck making a right-hand turn. The U-Haul truck finished turning and continued driving away! Adrenaline kicked in and Richie managed to jump out of his car to catch up with the U-Haul truck. Before catching up to the truck, Richie witnessed the U-Haul truck hit another vehicle. Richie finally stopped the U-Haul truck and explained what had happened. The U-Haul truck driver claimed to not have noticed hitting anything. The police arrived at the scene and wrote in their report that there were NO INJURIES. As a result of the accident, Richie experienced headaches, neck pain and lower back pain. Even a few months after the accident, Richard continued having an aching cranial pain that would last for several minutes to an hour every day. The pain that Richard had in his neck and back was constant and became worse with movement. He also experienced intermittent discomfort and tingling throughout his left leg. Richie’s friend was a client of Adam Handler and told him to contact him immediately. True story: right as the U-Haul truck hit Richie’s vehicle, that same friend called his cell phone at that exact moment! As if it were meant to be, Richie trusted his friend’s advice and called The Case Handler. 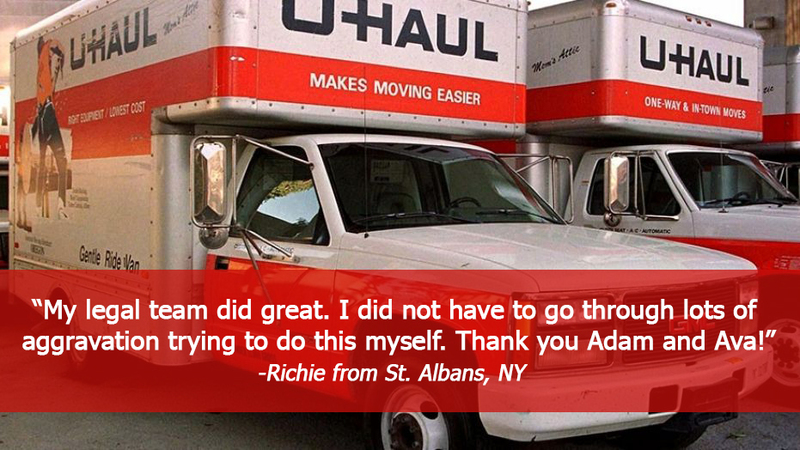 Although the U-Haul truck driver was not properly insured, AND the police report wrongfully stated that no injuries occurred, Adam Handler – The Case Handler still helped Richie recover $20,000.00! No one expects to be injured in a parked car. Just because you are not taken away on a stretcher after an accident, does not mean you weren’t injured. In Richie’s case, there were a couple of obstacles to fight through…but justice prevailed in the end. Even if you feel normal after being in a car accident (and can walk away like Richie could), get examined by a medical professional just in case. Also, contact an experienced Queens parked car accident lawyer that will guide you in the right direction.